Wake me when they finally keep their promise of single user season replays. Until then they won't get any more money from me. I agree. For $15 a month, they should have all their seasons available to play solo. Give me the option to roll my own dice too like Strat-o-matic does. I guess it is too late now as I took the dive into Strat and I absolutely love it. Single season replays are in the plans after the new live draft room and multi-player public draft leagues launch. Currently all seasons are available to play solitaire or with a friend in "Series". 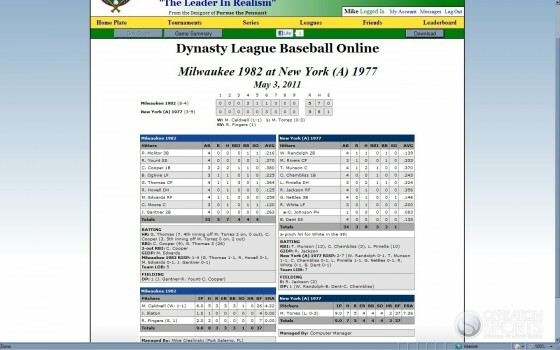 As Caley mentioned, what makes DYNASTY League Baseball Online really unique is the multi-player league experience so that has to be the primary development focus. This is the first full year for Private Draft Leagues and there has been an explosion of new draft leagues forming. 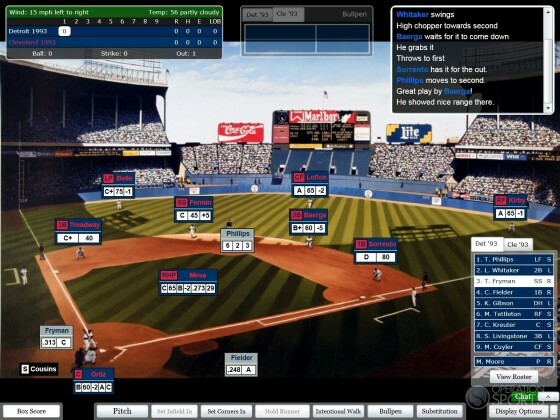 Think Fantasy Baseball with a simulation game. One of the main benefits for leagues is that you don't have to import and export files to a league Commissioner to update stats, standings and leaders - it is all updated in real time. I end up captivated watching other players games in my league being updated in real time - especially during the Pennant race. OMG, Old Municipal Stadium. Might have to get this. Which is great Mike and the game conversion is great, love it. However being in an online league just isn't going to work for me due to my travel schedule, etc. Solo replays (Strat, DMB, PC Replay, ActionPC) or Management Sims (OOTP, PureSim, Baseball Mogul) are really what grab my attention and keep it. I can play at my own pace, when I have time, with my own rules, etc. I heard that Solo replays were in the works from you guys at least a year ago. I realize you have other priorities, but I am one of the guys that was buying PTP and Dynasty League the board and CPU versions from the very beginning. Really feeling left out in this new venture. It is what it is, but I just can't justify the subscription for what I get. Years ago....I didn't mind having to work around certain aspects of games in order to make a single player season work. Strat is awesome...but this would have been my first choice. Hoping for an update eventually. Well, this is certainly the best baseball simulation out there. You get detailed batting, detailed fielding, detailed pitching, detailed weather, detailed park....realism across the board. You get a pretty an extraordinary online community, where you can play unique draft leagues, greatest teams leagues, and multiple daily greatest team tournaments (that take between 1 and 2 hours) each day to complete. There is a robust facebook community that supports this game and contributes to suggestions, and an ownership group that actually responds in the same day to concerns and suggestions. I understand the season solo replay issues....and I believe the ownership group is working on this. As a guys who graduated through Atari Baseball, Intellivision Baseball!, Intellivision "Computer" Baseball!. 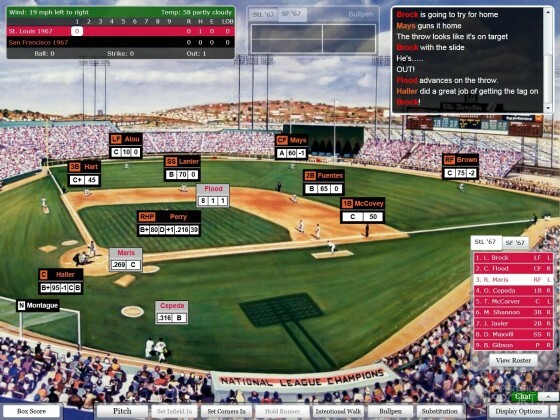 "Computer League Baseball (forgot the name, the first fairly robust CP disk game)", Earl Weaver Baseball, Tony LaRussa Baseball, Diamond Mind, OOTP....to this...to me the online interaction trumps with other real live players, and the ability through using the highly customizable COMPUTER MANAGER when I can't "LIVE" head-2-head against other team owners makes this a much better experience. I've probably played a couple thousand computer seasons solo, and while they were enjoyable, nothing compares to being able to play and compete against someone who makes better decisions than anything ever created as an Artificial Intelligence. There's people on the site I honestly don't like....and they probably don't like me. Honestly I think that's a good thing. There's a real emotional investment into the action. The quick action tournaments, and the competition therein, along with the season long and greatest team tournaments, makes this an experience I think is certainly worth the investment. I for one was one of the guys that liked to replay every day of a season. With every single season I played, it was too easy to beat the computer. Random number generator be damned, it was too easy. Maybe some positive reinforcement is good, on some level. But it's not very gratifying. You won't find that here. Hopefully you'll probably enjoy that more. 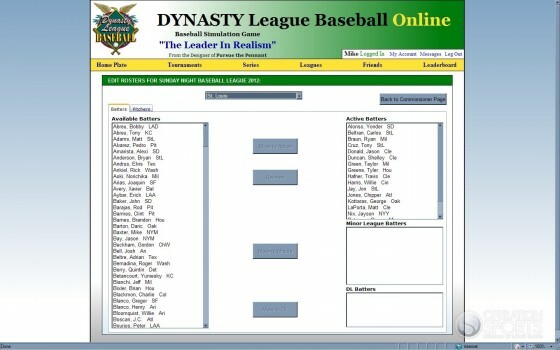 If you can't play every series in a league...set up the computer manager. It's much more robust than Diamond Mind. When you can play against a live opponent, more than likely you'll find a much more robust and thrilling challenge than just "beating the weak AI". There isn't pretty graphics..there isn't animation...but there is an unequaled amount of interaction. And something that actually looks, feels, and plays like real baseball would play. If you join and play the Greatest Team Tournaments Daily, don't get a team with very good left-handers. My favorite teams have a little bit of weakness against them. Gonna have to disagree. Still for me, until they get solo replay, it's a non starter. Simple as that. I don't have the time nor the flexibility of schedule to play in leagues. It's Solo Replay of bust for me. Until that time, OOTP and PC Replay Baseball will continue to get my baseball dollars. Most of what needs to be in place is now completed for solitaire season replays with options for a friend (s) to join too. Basically it will work the way the current Commissioner tools are set up for Private draft leagues except you will be able to assign a computer manager to a team instead of a friend. The first multi-player real time season replay league just launched with 30 people playing each team from the 2013 season. As soon as it's in, I'll be the first to subscribe.